What do you think of a possible new deal for Diego Costa worth a reported £220,000 per week? Having rejected a possible move to China in favour of staying at Chelsea, it now seems (according to reports) that Diego Costa is set to sign a new five-year contract worth a staggering £220,00 per week. Just to point out that I state that he rejected a move to China but I think we can all agree that he had little choice with the club not being prepared to negotiate a move away from Stamford Bridge. This despite seriously considering moving to China for ridiculous money. As we know the club stated that Costa was injured and unavailable for our victory over Leicester but I am sure that there was much more to it than that. As for the team, they won comfortably at the home of the current champions and Costa seemed to have put himself in a difficult situation at the training ground. In the subsequent days that followed, Costa was pictured embracing the coaches which a smile on his face and everything seemed to be back to normal. We have hardly mentioned "China" since. 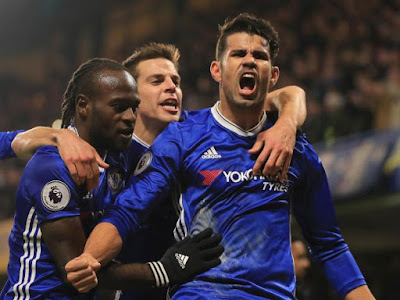 It now seems that the reason we haven't thought much about a possible move in the summer is because according to this report in The Independent, Costa and his representatives have negotiated a new deal to keep the Spanish striker in West London for the next five years despite denials coming out of the club being reported tonight. So to the new deal on the table and it's being stated as £220,000 per week with add-ons that could take his potential earnings during that time to £65m which is staggering really when you think about it. If these reports are true, it's clear that both Antonio Conte and Roman Abramovich have earmarked Costa as the man to lead our charge for silverware both domestically and in Europe. I loved Diego Costa when he first arrived at our club for the way he played the game, for his goal scoring abilities but also because he played with such an aggressive intensity that took the Premier League by storm. He was almost unplayable at times in that first season and despite the odd flash point/incident at times, he still scored plenty of goals that led us to our first title in five years. Last season was very, very different and it was clear that he had lost his way in the first half of the season. He came back to the club out of shape from the summer, the goals dried up and the flash points in games became more frequent. He didn't look anything like the player he was. The only thing, in my opinion that Guus Hiddink achieved last season was to get Diego Costa back on track and he finished the season far better than he started. The flash points in games disappeared and he had his focus back on his game. However, when the season finished all of us expected him to leave the club if we are honest so any possible talk of a potential new contract would have been out of the question. So to this season and in my view Diego Costa is a much better striker than we have seen in the last two years. His overall play is so much better and he demonstrates this every single week whether it's by scoring goals, creating goals or assisting with other goals through his link-up play or just his work ethic in general. He has become as close as anyone has got to Didier Drogba in my book and has scored 52 goals in just 104 games so far. You look around the game and you have to ask yourselves the question "Is there anyone better than Diego Costa to suit our game" and the answer would have to be "No!". Should Chelsea do everything in their power to try and keep him at the club for next season and beyond when we hopefully will be back in the Champions League? Yes we should. If it means we give him a new contract worth £220,000 per week for the next five years then I believe that to be excellent news. What do you think?